The AP-124 and AP-125 802.11n indoor access points are designed for maximum deployment flexibility in high-density environments that require above-ceiling or enclosure-based installations. The multifunction AP-124 and AP-125 are ultra-high-performance indoor 802.11n access points (APs) designed for maximum deployment flexibility in high-density environments that require above-ceiling or enclosure-based installations. These high-speed APs deliver wire-like performance at data rates up to 300 Mbps per radio. 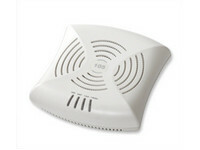 The AP-124 features two 3×3 MIMO dual-band 2.4-GHz/5-GHz radios with detachable antenna interfaces while the AP-125 features the same radios with integrated antenna elements. Both are built to provide years of trouble-free operation and are backed by a limited lifetime warranty. 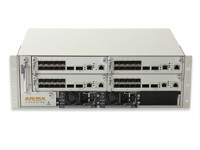 Working with Aruba’s line of centralized Mobility Controllers, the AP-124 and AP-125 deliver secure, high-speed network services that move users to a “wireless where possible, wired where necessary” network access model. The network can then berightsized by eliminating unused Ethernet switch ports and thereby reducing operating costs. 802.11n enables the use of wireless as a primary connection with speed and reliability comparable to a wired LAN. It also increases performance by utilizing techniques such as channel bonding, block acknowledgement and MIMO radios. Advanced antenna technology also increases range and reliability. The key to ensuring wire-like performance and reliability is Aruba’s unique Adaptive Radio Management and spectrum analysis* capabilities, which manage the 2.4-GHz and 5-GHz radio bands to deliver maximum client performance while mitigating any RF interference. • Value-priced indoor 802.11n dual-radio, dual-band AP for high-density deployments in offices, hospitals, schools and retail stores. • Spectrum analysis remotely scans the 2.4-GHz and 5-GHz radio bands to identify sources of RF interference. 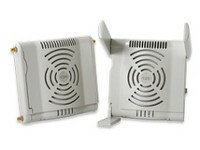 This provides visibility into non-802.11 RF interference sources and their effect on 802.11n channel quality. For more country-specific regulatory information, and approvals, please see your Aruba representative. AP-120-MNT-WJ Mounting hardware kit and product enclosure to facilitate secure wall or ceiling mounting of an Aruba AP-121 or AP-125 access point to a standard North American or BS telecom/data port wall gang box, or to a 15/16” or 9/16” ceiling tile rail. 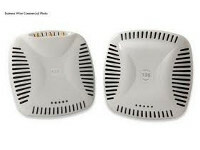 AP-120-MNT-CV Cabling cover mounting kit to facilitate tamperproof mounting of an Aruba AP-121 or AP-125 access point.